Artists Ya’ara Zach was an Outset StudioMakers Tel Aviv guest. Zach worked during March – June 2018 in the studio, towards two exhibitions titled “Unreasonable Doubt”` exhibited at the Petach Tikva Museum of Art, curated by Hadas Maor; and at the Moscow International Biennale for Young Art, Russia, curated by Lucrezia Calabrò Visconti. Yaara Zach’s new installation for the 6th Moscow International Biennale for Young Artists, is comprised of distinct sculptural elements that fuse together crutches and whips to new, independent bodies. Lying on the floor, next to the crutches-whips is a series of almost monochromatic black objects that appear as different evolutionary stages of the fused bodies. They have now grown limbs in the shape of transparent liquid bags filled with black and dark purple ink. Some liquid parts are hanging in space, rooted in organic shaped crutches’ legs. In this work, the body is incomplete. It exists in the gaps, as a negative of itself. These corporal elements are spread on a wooden stage, which becomes a platform for various physical interactions: the spectators are invited to step on the stage and into the work and to explore the inanimate objects. Every movement is accompanied by distant sounds, as the work functions like a large-scale resonance box. The viewers move to and from the installation’s arena and are constantly changing positions: from active to passive, from witness to participant, from able to disabled. Yaara Zach’s sculptural environments are based on sterilized ready-made objects and industrial materials, untouched by the human body. They go through processes of de- and re-assembly, exploring the fluid relationship between beauty and violence, and between the industrial and the intimate. Yaara Zach’s installation “Unreasonable Doubt” is composed of several works, which appear as a series of reincarnations evolving out of one another. 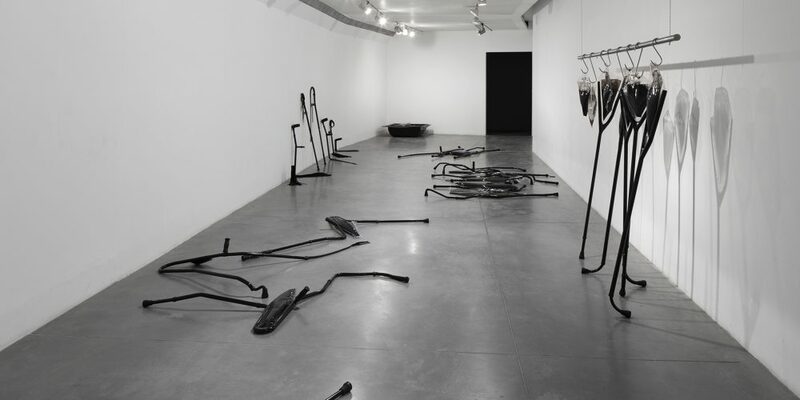 It is a largely black, almost monochromatic installation, in which materials and forms seem to flow from one piece to the other, echoing one another while tracing the memory of an intimate encounter between the body and various objects found in its surroundings, perhaps ones that are supporting it. In doing so, Zach’s work also traces the manner in which memories are constructed and consolidated, coming to appear closer or more distant, and changing uncontrollably.